Indeed, Terry! 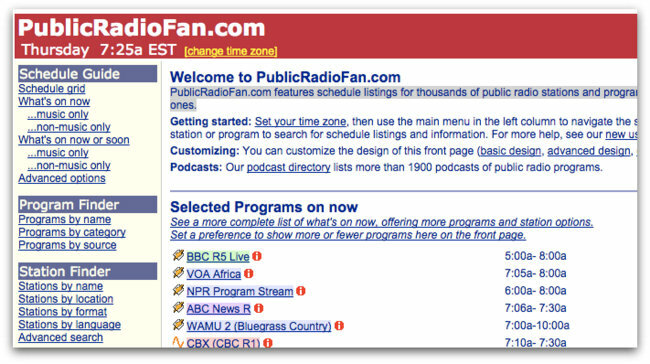 Public Radio Fan is a fantastic resource–especially for SWLs who enjoy listening to public broadcasters who are no longer on shortwave. The site makes it easy to search for broadcasters; it has a very simple and responsive user interface. Public Radio Fan was created in 2001 and is maintained by its creator, Kevin Kelly. I don’t know where he finds the time to curate this database, but I’m glad he does! Definitely worth the mention. Thank you, Terry! Click here to go to Public Radio Fan. This entry was posted in Broadcasters, International Broadcasting, News, WiFi Radio and tagged Internet Radio, Public Radio Fan, WiFi Radio on January 31, 2016 by Thomas. When I went to this site, I was reminded that Shoutcast still exists. I remember using it a lot when I had a PSP (back in the mid 2000s) and tuned to the BBC, WRN, and Radio Netherlands web streams. Looking at this site right now, it’s a good thing this site and other directories like TuneIn Radio exists. As an addendum to my previous reply, some of the links DO indeed work with a Chromebook, particularly those using the JW Player, and this site is certainly worth “a go” even for those of us with “Fisher Price” operating systems like Chrome. This would indeed be a great resource, but unfortunately Chromebooks don’t recognize “playlist files”, and Google has NO intent of correcting the situation, in fact they have flat out refused, despite numerous requests. One more reason to return to a PC, and for Google to burn in Hell. You’ll have a better experience with an Android tablet than Chromebook. I am not sure if VLC Media Player is available on Chromebooks but if it is…the program should support all sorts of streams. Of course, there’s TuneIn Radio and has tons of broadcasters on numerous streams. However, a Windows PC works much better as well. This is a good resource, thank you very much. We have a local NPR on AM and it’s such a breath of fresh air to listen to a program format so different than the others are broadcasting.